The aviation industry is currently prospering across the world on the back of radically increasing traveling activities of urban populations, for both business and pleasure, and decreasing cost of air-travel. Consequently, various aspects of the broader aviation industry are gaining traction, including the market for refueling aircraft, which are adequate as a solution to incidences of oil spills due to faulty refueling equipment. In addition to that, fuel economy of aircrafts is invariably low, which makes a strong case for maintain a robust reservoir of fuel for the vendors operating in the aviation industry. According to this business and commerce study, the demand in the global refueling aircraft market will multiply at a notable CAGR of 4.8% during the forecast period of 2017 to 2025. 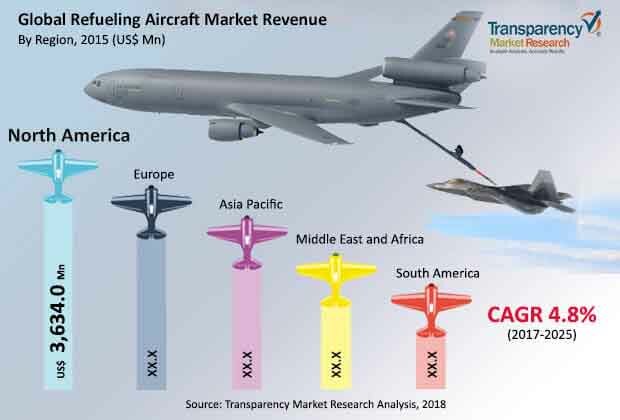 The analysts of the report have evaluated that the opportunities in the refueling aircraft market, worldwide, will provided for a revenue of US$8,146.0 mn in 2015, and have estimated it to swell up to US$12,868.7 mn by the end of 2025. Stringent international safety regulations that are implemented for the aviation industry, persistent need to achieve greater fuel efficiencies, recent advancements in the pertaining technologies that can ensure dependency, and increasing number of air travelers are some of the key factors augmenting the demand in the global refueling aircraft market. This report segments the refueling aircraft market on the basis of component, refueling medium, and aircraft type. On the basis of component, the market is categorized into aviation refueller, dispenser, refueling pods, probe & drogue, and others. The aviation refueller segment is further divided into 7000-25,000 liter aviation refueller and 25,001-50,000 liter aviation refueller. The dispenser segment has been classified into three major types as hydrant dispenser, mini hydrant dispenser, and others. In 2016, the dispenser segment accounted for the maximum market share in terms of revenue by component, although the demand for the probe & drogue system segment is projected expand at a stronger CAGR during the forecast period. The refueling pods segment is expected to show significant growth during the forecast period due to the increasing adopting of aerial refueling within military sector. Moreover, other factors such as increasing air traffic globally and rising international aircraft fleet are expected to further fuel the demand for energy efficient aircraft refueling system. By refueling medium, the market has been bifurcated into air to air (in-flight) refueling and tanking method. The air to air refueling segment is studied as flying boom method, probe & drogue method, and others. Various aircraft types considered under this study includes commercial airplane, military airplane including combat aircraft and non-combat aircraft, and helicopters. Over the course of the forecast period, the demand for boom method of aerial refueling is predicted to witness considerable. This is due to growing acceptance of fly-by-wire (FBW) boom system, which are gaining popularity for being light weight and offering enhanced control performance. Among various aircraft types, non-combat aircraft segment is anticipated to witness positive outlook in coming years. Geographically, North America and Europe provided for more than two-third of the demand share in the global refueling aircrafts market. By 2025, these two regions are estimated to provide for opportunities worth US$5,529.3 mn and US$3,310.7 mn respectively. These regions have large number of commercial aircrafts as well as strong military segment. However, emerging economies of Asia Pacific, such as China, India, South Korea, Japan, Malaysia, and Thailand, are predicted to drive market growth in this region. Middle East countries such as UAE and Turkey are foreseen to witness decent growth in international aircraft fleet due to strong tourism industry. Lockheed Martin, Cobham Plc., Refuel International, Eaton Corporation, General Electric Aviation systems, Garsite LLC, Fluid Transfer International, and Marshal Aerospace & Defense Group have been identified as a few prominent companies who are currently ahead of the curve in a fairly consolidated competitive landscape of the global refueling aircraft market.